The AP identified 107 people listed as speakers and staff on more than 21,000 pages of customer-satisfaction surveys the Republican presidential nominee has released as part of his defence against three lawsuits. Trump and his attorneys have said repeatedly that the surveys show the overwhelming majority of participants were satisfied. 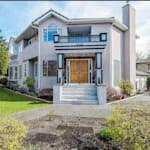 However, the suits allege his namesake real-estate seminars were a massive fraud designed to "upsell'' students into buying course packages costing as much as $35,000. Some names from the surveys were too common to narrow down to individuals, but AP used online resumes, court filings and other public records to piece together detailed background checks on 68 former Trump staffers. The results could complicate Trump's legal defence that his Trump University "apprentices'' got the top-flight instructors and mentors they paid for. Half of the 68 former faculty and staff identified by AP had personal bankruptcies, foreclosures, credit card defaults, tax liens or other indicators of significant money troubles prior to teaching Trump University courses promoting "wealth building'' and "how to invest like a billionaire,'' according to AP's review. Many of those hired to teach did not have college degrees and were not licensed to broker real estate. 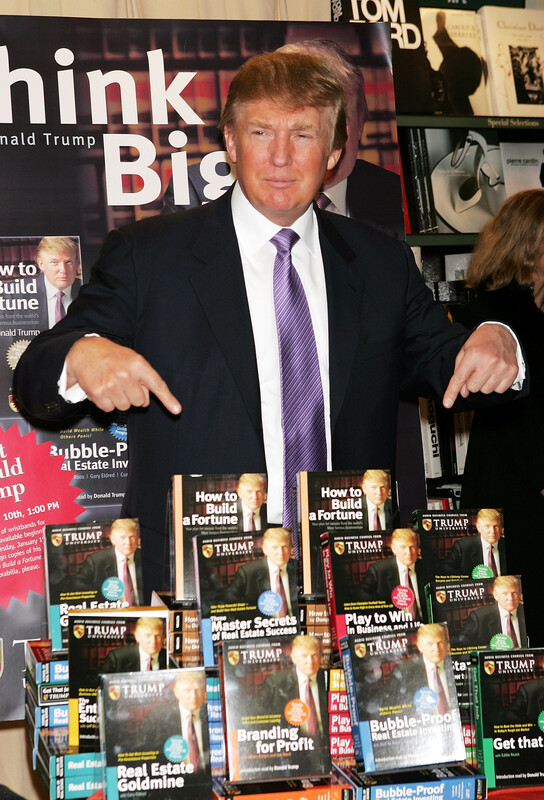 "At Trump University we teach success. That's what it's all about. Success. It's going to happen to you." New York Attorney General Eric Schneiderman sued in 2013, alleging that the university was a "fraud from beginning to end,'' geared toward pressuring students into buying ever more expensive seminars, course materials and mentoring services of little educational value. 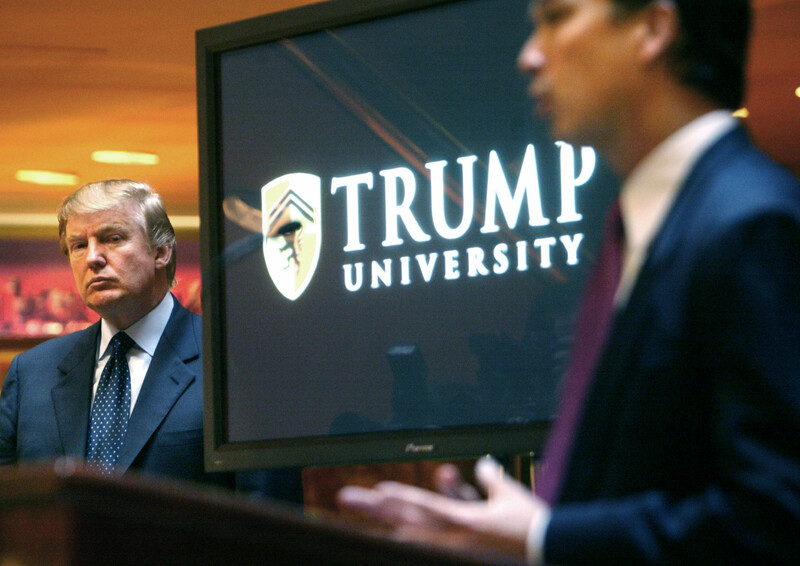 Regulators say Trump University staff often targeted senior citizens or those already in dire financial straits, encouraging them to max out their credit cards to pay for classes they couldn't afford. In California, there are two federal class action suits filed on behalf of former students. One case is headed to trial Nov. 28, three weeks after the presidential election. In an unusual legal manoeuvr, Trump's lawyers last week asked the federal judge overseeing the case to exclude any statements he made during the presidential campaign, arguing that allowing jurors to hear the Republican nominee's words would irreparably prejudice them against him. Asked whether he could recall the names of any of his hand-picked instructors, Trump, who in the past said he had "one of the world's greatest memories,'' said he was unable to do so. When a lawyer asked Trump in a December 2015 deposition if he had ever heard of Gorsline, the businessman responded that "too many years'' had passed for him to recall. After Pell co-operated with law enforcement against other drug dealers, a judge sentenced him to three years in state prison and a $50,000 fine, according to records. "Honestly, if you don't learn from them, you don't learn from me. If you don't learn from the people we're going to be putting forward — these are all people that are hand-picked by me — then you're not going to make it in terms of the world of success,'' Trump said.